After hearing my friends rave about Efrain’s for weeks, I finally persuaded them to bring me to their favorite, local spot for quick and cheap eats. Better yet, I persuaded them to drive so I could sample my first Efrain’s margarita, and damn was I sure we made that arrangement. 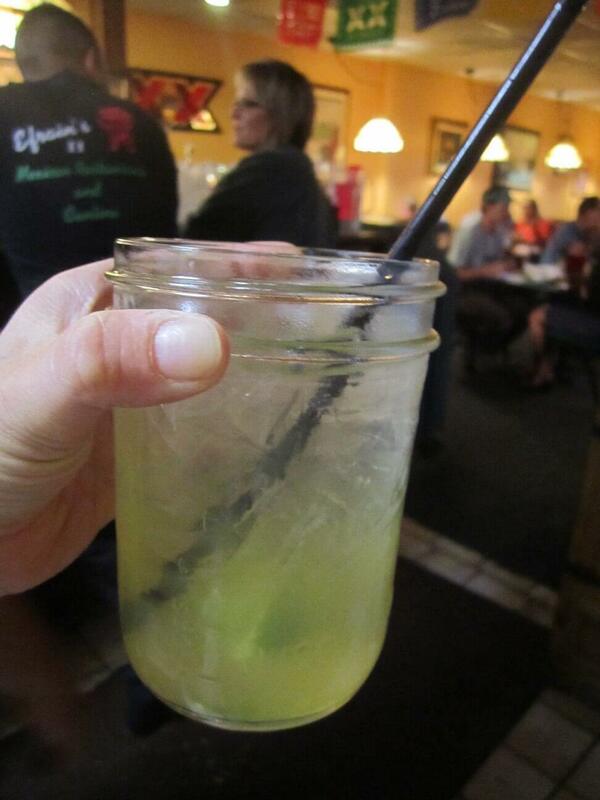 I decided to dive right in and order a marg from the bar while we waited for our table: rocks, no salt. As I watched the bartender pouring this delicious concoction, I kept waiting for her to lay off the tequila, but it kept coming until about right below my thumb. For five bucks, this strong and icy beverage was the perfect way to pass the time while waiting the ten minutes for our table. Yet by the time we sat down, I was already feeling the tequila and ready for the chips I’d been eyeing since we walked in. 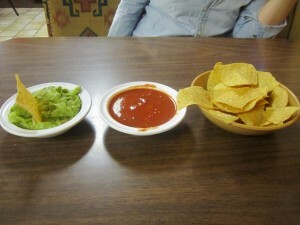 Immediately upon being seated, we dove into the chips and salsa, which were waiting for us at our table, accompanied by a side of guac which we ordered in addition. There was nothing canned or mass-produced about any aspect of this starter: it was the real deal. The salsa was hot, yet paired with the fresh guac, was the perfect combo of spicy and cool. Though the salsa was a little soupy for my liking, the guac was hearty enough to make up for it, and I enjoyed dunking one chip in both dips. My date (Kate) and I both opted for Efrain’s combo platter for our main course. This dish featured the choice of three different tasting options. For ten bucks, this colossal dish was more than satisfying and a great way to sample a few different items. Out of the choice of about eight options, I went with a chicken enchilada, chicken taco and rice and beans. It would be a struggle to find something bad to say about any of them. First off, the enchilada. I could barely focus on the filling inside the tortilla because the sauce and melted cheese was so killer. The red sauce that the enchilada was swimming in contained the perfect amount of spice and flavor without overpowering the dish, but I wished the sauce was smothered over the entire plate, not just the enchilada. Though I’m still debating whether or not the enchilada actually had chicken in it, it didn’t even matter. For the chicken taco, it was the presentation that really made it stand out. 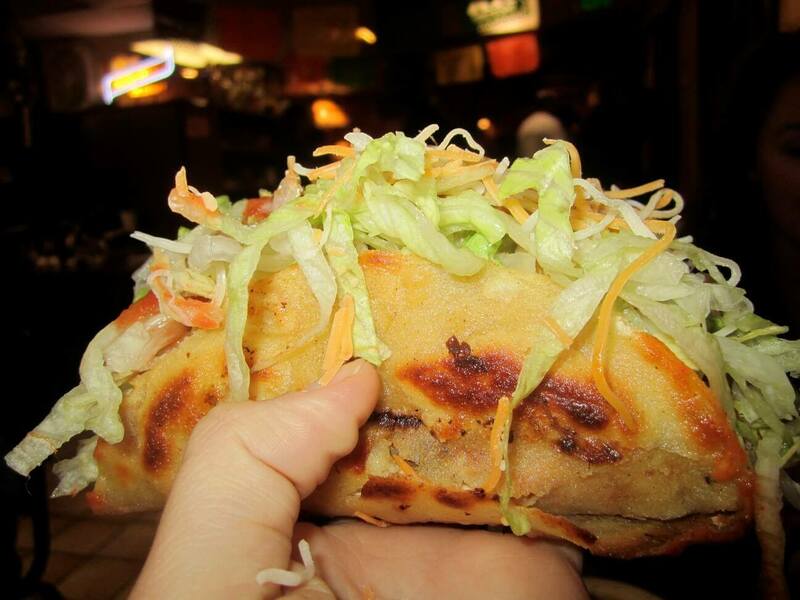 After stuffing (and I mean STUFFING) a tortilla with shredded chicken, shredded lettuce, and cheese, they then grilled the entire taco to make the tortilla crispy. I had never heard of a taco being prepared this way before, but it really added a nice touch to an otherwise standard dish. Though the chicken inside was a little dry, a little of the red enchilada sauce did the trick. Last, but not least, the rice and beans. Normally, I would never order such an average dish when every other item on the menu was popping out at me. 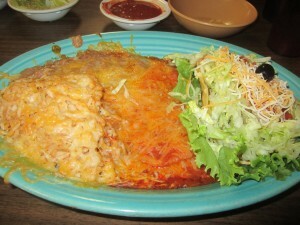 Yet I took Kate’s advice, and ordered her absolutely favorite dish of all time, which she swore Efrain’s did it right. One bite in, and I was glad I took the advice. The rice and beans were out of this world. The beans were flavorful yet not mushy, rice was cooked perfectly, and all was topped with a layer of melted cheese, which again I mixed with the enchilada sauce. I think it was the melted cheese that really put it over the edge, but no matter what I order at Efrain’s from now on, I will absolutely be sure to order the rice and beans as a side. The combo plate was the perfect option to first-timers like myself to sample a few different items. And it was so huge, I took about half of it home for lunch the next day. Efrain’s is hands down one of the best deals in town, absolutely the best Mexican I’ve had in the area, and is so off the beaten path it is a great change of scenery. The only draw back to this is it is about a ten minute drive, which is unfortunate if you’d like to sample a margarita, or two. Nevertheless, it is absolutely, 100% worth the drive and possible wait, for hands-down the best Mexican food in town (but what do I know, I’m from Boston). There are Boulder people who would crawl across glass to eat here. I’m not one of them. 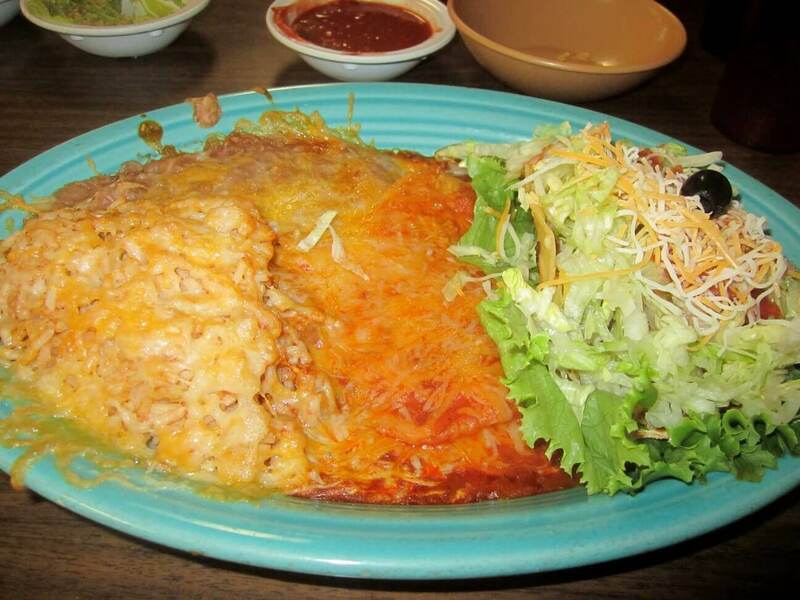 The best Mex food is in Longmont. La Panda on Main St. across from the cemetery is the real thing. This is a wonderful WordPress Blog Website. I got your sight inrtamfoion from my FatCow newsletter.I love your affiliate links. Im gonna have to learn more about the coupons and stuff. Anyway, I love the blog because I live in New Mexico. It seems like you are right on target with these articles. I am anxious to try some of the places you mentioned in Socorro. We go through Socorro often on our way to the Butte. I stopped in San Antonio several times for an Owl Burger. I did not even know about the Buckhorn. I do need to try one of the other restaurants mentioned in Socorro. I tried another Mexican restaurant there once. It has two names in the title. It was pretty good. There are so many wonderful places to eat in New Mexico. We live in Rio Rancho and travel often to the Frontier. Great hang out and Great Food.Rio Rancho is loosing a Not so good Restaurant here. It is finally closing down. Nice little place for a Golden Pride . Lets tell the owners of Golden Pride and Frontier. Thank you for a great New Mexico Food site. LOL. These WERE really good. I was skpcaietl because I was literally just throwing stuff in the pan without a recipe b/c all the ones I read had canned soup and I refuse to eat that dog crap. Its too slimey! Anyhew…super duper easy…and SOO good!! !